Maison Noir is a delightful cafe and tea room offering a wonderful selection of snacks, meals and sweets. It is laid out in a polite, smart manner. Take a step inside Maison Noir and discover its charming elegance and superb menu. Maison Noir is one of the most welcoming places that we attend with very friendly staff. We have been coming here for 2 or so years and wouldn’t go anywhere else in Hadleigh. I thoroughly recommend the good selection of cakes of which most, if not all, are homemade and most of which I have tested. Wanted somewhere i could catch up with a friend so we went for afternoon tea. The price is brilliant for what you get for your money!! People considering afternoon tea here should know that its a pot with tea bags…all the lovely different types and favour are there but don’t expect real leaves .me a strainer. lovely warm welcome, people really friendly, was unsually quiet so allowed us to take our seat early which was great. The sandwiches were full of filling and deliciously fresh, cake an scone very nice. Had pot refilled twice and was offered to have any treats we couldn’t manage boxed up to take home. Visited Maison Noir today for lunch with my mum, absolutely fantastic service, helpful smiley lady, food was delicious, fresh homemade sandwiches, cakes were lovely, really lovely feel in cafe’, will definitely go again soon for afternoon tea. Simply very nice food, a very nice atmosphere and very nice people all at a sensible price. A must visit when in Hadleigh. Lovely menu, always fresh and tastefully presented. eating and drinking here a pleasure. A charming tea room offering great food and excellent service – visited today for an afternoon tea with friends and thoroughly enjoyed the experience. Probably the best afternoon tea I have had, at a fraction of the price previously paid at other venues. Well worth a visit! Excellent service we had tea for two, really fresh cakes and sandwiches. Maison Noir is by far one of the best cafe’s in Hadleigh allway welcome you nicley! would recomend it to anyone, they have goo food and drinks and a very nice atmosphere to it! Really warm and welcoming cafe. The sandwiches and cakes are fantastic. Have not tried the afternoon teas yet but they look fantastic. Lovely outdoor area too. 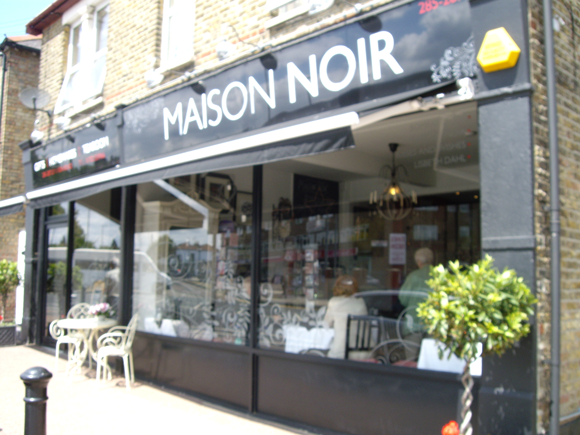 Maison Noir is a real find in Hadleigh. It is always busy and the atmosphere is buzzing. The cakes are second to none!!!!!!!! Also try the toasted teacakes – absolutely yummy!!! This is how a small cafe should be run. and have a ready smile for all. Old fashioned service isn’t a dirty word! It is a pity that there are not more shops in the area that are of the standard and class of Maison Noir. This is the quality that we want locally. The service is very friendly and the food is fresh and tasty and they are very welcoming. If I have visitors from out of town, this is really the only place that we can walk to for lunch or a lovely tea and cake. I recently had cause to write a letter of complaint to Maison Noir. To date they have not even had the courtesy to reply to my letter. This cafe may offer good food but my disabled mother and I never got the chance to try it! Thank you for your comments and may i take this opportunity to say how we value all of our customers ideas on how to improve our business . Unfortunately on the day you tried to come in were full to capacity as we are each day at lunchtime and due to this we are unable to accommodate customers who only want coffee at this time .There is certainly no restrictions on wheelchairs or pushchairs as we have many mums with their babies who regularly come to our Teashop and also many disabled or elderly who use wheelchairs . Please come along and try us again we do lovely sandwiches , fresh homemade soup and delicious homemade cakes . Every time I go to Maison Noir I receive a very warm and friendly welcome. The food is excellent and the strawberry cheesecake to die for (amongst the others on offer). It’s the best place to meet people in the area. Thanks Janine and Maxine – your’e the best! Maison Noir in Hadleigh is an Oasis! If ever a tea-room deserved to succeed, then Maison Noir should be in the front line! Can’t rate it highly enough!